(RNS) -- Pollsters and politicians hunting for the rare and elusive undecided voter might want to train their sights on the pulpit. A whopping 22 percent of Protestant pastors haven't settled on a presidential candidate, according to a survey released earlier this month by LifeWay Research. By comparison, just 4 percent of all likely voters remain undecided, according to Gallup. The undecided pastor trend doesn't appear to be a one-time fluke. A similar survey conducted in October 2008 also found that 22 percent of pastors hadn't chosen between Obama and then-GOP nominee Sen. John McCain. The survey of 1,000 Protestant pastors was conducted Sept. 26-Oct. 3 by LifeWay Research, a division of LifeWay Christian Resources, which was founded by the Southern Baptist Convention. Pursued by politicians, mocked by "Saturday Night Live" and barely tolerated by partisans, undecided voters get a bum rap. But there are good reasons for pastors to remain ambivalent until Election Day, experts said. "A lot of folks don't want to be pinned down, particularly during such a polarized time," said the Rev. Roger Ferlo, dean and president of Seabury Western Theological Seminary in Chicago and Bexley Hall Seminary in Columbus, Ohio. Most congregations mix Republicans, Democrats and independents, all of whom fall under pastors' care. "There's a danger that you could be reduced to your political opinion," Ferlo said, "and therefore sacrifice your credibility with one group or another." 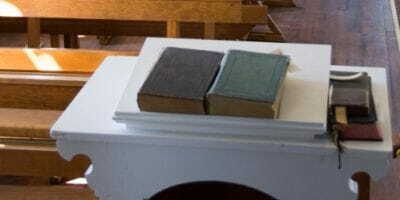 In addition, many mainline Protestants are recovering from rancorous fights over sexuality and the role of gays and lesbians in their churches. "People are tired of the partisan fray," Ferlo said. The survey found a slightly higher percentage of undecided mainline Protestant clergy (25 percent) than evangelicals (22 percent). Younger pastors and political independents were more likely to say they hadn't chosen a candidate. Another reason for the reticence: many pastors already get heaps of criticism from their congregations, said Kenneth Swetland, a senior professor of ministry at Gordon-Conwell Theological Seminary in South Hamilton, Mass. As a result, clergy can be reluctant to express opinions on divisive subjects like politics. "Pastors are very sensitive to criticism," said Swetland. "If I had a hunch, it would be that they are not undecided. They just aren't declaring who they are going to vote for." Unlike other surveys, the pastors poll didn't offer respondents the option of saying they "lean" toward voting for Obama or Romney, which also likely boosted the number of undecided clergy, said Scott McConnell, director of LifeWay Research. "Most Americans wind up having to compromise something they want when choosing candidates, and that includes the presidential race," he said. "But pastors tend to be pretty definite in their beliefs and in the advice they give people from the Bible. They are not used to gray areas." Count Tally Wilgis, an evangelical pastor in Baltimore, among those unwilling to compromise on choosing a presidential candidate. The 34-year-old said he won't vote for Obama because of his support for gay marriage and abortion. But he won't vote for Romney either because of his Mormon faith -- a view that he suspects is common among undecided clergy. "When I read that survey, I don't read it as 22 percent of people don't know where they stand on the issues," Wilgis said. "I read that survey as saying that 22 percent are having a hard time voting for a Mormon." According to the LifeWay poll, nearly a quarter of the undecided pastors said their hesitation to vote for Romney was influenced by his membership in the Church of Jesus Christ of Latter-day Saints. Most evangelicals do not consider Mormons to be Christians, according to several surveys, but the vast majority say they will vote for Romney on Election Day. The Rev. Holly Davis, the rector of St. John's Episcopal Church in Franklin, Pa., said she hasn't decided on a candidate, even after the three presidential debates. In fact, the third debate, in which both candidates ignored the debate topic by focusing on the economy instead of foreign policy, made her angry. "They're so ego driven, they can't even follow simple instructions," Davis said. The 44-year-old said she had an easier time choosing Obama in 2008, when she had just entered the priesthood. "My thinking is changing," said Davis, a self-described libertarian who reads Ayn Rand's novel Atlas Shrugged every two years. She still doesn't like big government, but she's also concerned about her economically depressed community, where each day a half-dozen people drop by her office needing help. "I have to think about which one of these two men will have the least negative affect on the people I care for and love," Davis said. "Quite frankly, I don't think either one of them is capable of taking care of the issues at hand."